Home Lifestyle Relationship 7 Stages Of Marriage: What’s Your Stage? Every marriage moves through different stages as the years pass. From the excitement of the early days of being married right to the day when you’re both retired, your marriage will keep growing and changing. 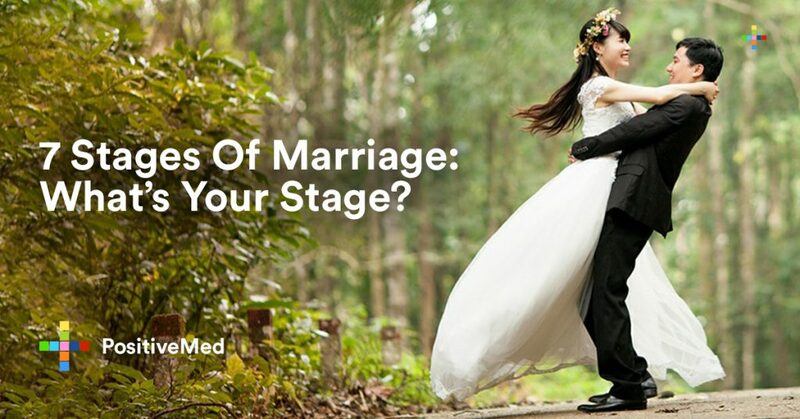 Understanding the different stages of marriage helps you analyze where your marriage is at right now. Read on to figure out which stage of marriage you’re in, and read these tips on how to navigate through each stage. Stage one happens at the beginning of your marriage. You’re newly married, perhaps even just back from your honeymoon. You’re setting up your new life together and your passion for each other is at an all-time high. This is a fantastic stage to be in as there is usually low conflict and lots to be excited about. This is also the perfect time to start laying a strong foundation for the rest of your marriage. By building healthy habits now, you can prepare to navigate all the following stages with grace. Risks: Getting too caught up in the passion and fun could give you a shock when you hit the next stage (reality check). Tips: Start laying a solid foundation for your life together. Get into good financial habits, figure out how to divide chores, and start making long-term plans to achieve your shared goals. This is when reality kicks in. As you settle into a routine of being married, you start to learn more about each others strengths – and weaknesses. To be honest: This is the stage where you learn all the ways in which you annoy each other. If she never loads the dishwasher or he is a chronic procrastinator, it’s likely to come out during the reality check stage. Seeing the reality of your life together can be disappointing after the first flush of stage one, but it’s also a good opportunity to learn more about each other and practice healthy communication. Risks: Focusing on what annoys you instead of seeing all your partner’s positive traits. Tips: Learn the art of good communication. Practice listening with empathy and kindness, and expressing your feelings and needs in a non-accusing way. Rebellion is a tricky stage. This is where your interests start to conflict with your partner’s, and your marriage feels like an impediment to your goals. Maybe you want to travel but they want to settle down. Maybe you both want to build your career but resent the other for building their career instead of supporting you. The rebellion stage can quickly become rife with conflict. Risks: Keep an eye on your thoughts and behavior so you don’t start to blame your partner for holding you back from what you want. Tips: Practice open, loving communication. Talk to each other about your hopes and dreams and figure out where you can support each other instead of fighting. Be prepared to compromise and get savvy about figuring out what really matters to you, and what you can let go. This stage happens around the time when promotions appear at work, kids arrive on the scene, and personal commitments just keep growing. You’re both so busy managing life and keeping your household running that your marriage starts to feel like a business arrangement. Most of your communications are about what is happening with your children or at work, or which appointment is next on the calendar. Risks: This is a busy stage, and if you’re not careful your marriage could take a back seat to everything else happening in your life. Tips: Make time for each other no matter what is going on. Check in with each other every day, and set aside a weekly date night to just be together and remember why you got married in the first place. The kids are grown, your careers are established, and your finances are looking stable. This is a settled period in any marriage, where life is ticking along nicely with less stress and often fewer commitments than in early stages. This can also be a time of dissatisfaction. If one of you is feeling bored with your lot in life, disillusionment can soon set in. Risks: Your everyday routine can start to feel a bit like groundhog day, with a distinct lack of connection to each other. Tips: Inject new life into your marriage by having some fun together. Take a class, or take a trip. Talk openly about what you both need from your marriage now, and figure out how to achieve it. Explosions can happen at any stage of marriage, but they get more likely as you enter middle age. Job loss, a major health scare, the death of a parent or financial troubles can shake the foundation of your marriage. An explosion leaves you both feeling raw and stressed. Your marriage can be a source of solace or further frustration. Risks: It’s easy to lash out at your partner when the going gets rough. Getting older isn’t always a smooth ride, and facing up to that is hard. Tips: Be there for each other. Take the time to just be with each other and offer support. Tackle difficult situations together as a team. Once you’ve made it through the ups and downs of a long married life together, you reach the completion stage. This is often one of the happiest stages in a marriage. You know each other well, and you’ve established a life you both find fulfilling. You’ve fought plenty of battles together, and you still side by side. Risks: It’s easy to get complacent at this stage and forget to appreciate your partner every day. Tips: Recapture the joy of stage one by spending plenty of time having fun together and embarking on new adventures. Appreciate each other’s good qualities and make sure your partner knows what they mean to you. Every stage of marriage has its challenges. Stay committed to each other and to your marriage and use each stage to strengthen your foundation and set yourself up for a loving, supportive future together. Author Bio:- Sylvia Smith is a relationship expert with years of experience in training and helping couples. She has helped countless individuals and organizations around the world, offering effective and efficient solutions for healthy and successful relationships. Her mission is to provide inspiration, support, and empowerment to everyone on their journey to a great marriage. She is a featured writer for Marriage.com, a reliable resource to support healthy happy marriages.